Assuming you are done reading and understanding the entire 12 chapters in our very first module – Introduction to stock markets, you are now warmed up to dig deeper! The objective of the first module is to give you quick hands on introduction to the stock markets. In our endeavor to introduce the stock markets to you, we have carefully selected concepts that you need to know, especially if you are absolutely new to markets. If you have many unanswered questions at this stage, it is a good sign. You will find your answers as we proceed to other modules. At this stage, it is extremely important for you to understand why we have so many different learning modules, and how these modules are interrelated. To give you a head up, here are some of the modules that we will cover in Varsity. 13.1 – So many modules – how are they interrelated? The idea of ‘Varsity at Zerodha’ is to put up a repository of high quality market related educational content. The content, will cover various aspects of fundamental analysis, technical analysis, derivatives, trading strategies, risk management, financial modeling etc. Each main topic is categorized as a module. If you are new to the markets, you could be wondering how each of these topics fit within the grand scheme of things. To help you get a perspective, allow me to post a simple question to you. In order to be successful in the markets, what according to you is the single most important factor? Success in markets is easily defined – if you make money consistently you are successful, and if you don’t you are not! So if you were to answer this question for me, chances are you will think about factors such as risk management, discipline, market timing, access to information etc as the key to be successful in markets. While one cannot deny the importance of these factors what is even more compelling and primary is developing a point of view (POV). A point of view is an art of developing a sense of direction on a stock or the markets in general. If you think the stock is going up, your POV is bullish hence you would be a buyer of the stock. Likewise if you think a stock is going down your POV is bearish therefore you would be a seller of the stock. Having said that, how do you actually develop a point of view? How do you figure out if the stock is going up or down? FA based POV – The quarterly numbers looks impressive. The company has reported a 25% top line and 15% bottom-line growth. The company’s guidance also looks positive. With all the fundamentals factors aligned, the stock looks bullish hence the stock is a buy. TA based POV – The MACD indicator has turned bullish along with a bullish engulfing candlestick pattern, with that study the stock’s short term sentiment looks positive therefore the stocks is a buy. QA based POV – With the recent up move, the stock’s price to earnings (PE) touched the 3rd standard deviation. There is only 1% chance for the PE to breach the 3rd standard deviation. Hence it is prudent to expect a reversion to mean; therefore the stock is a sell. Outside view – The analyst on TV is recommending a buy on the stock therefore the stock is a buy. The POV you take should always be based on your own analysis rather than an outsider’s view, as more often than not one ends up regretting taking an action based on an outside view. So after developing a POV what does one generally do? Does he straight away go and trade the point of view? Here is where the complexity of markets starts to kick in. Buy the stock in the derivatives markets. Within the option market there are call options and put options. So what you choose to do after developing a POV is a totally a different ball game. Choosing the right instrument to trade which complements your POV is highly critical to profitable trading. For example, if I’m extremely bullish on a stock from 1 year perspective then I’m better off doing a delivery trade. However if I’m out rightly bullish on the stock from a short term perspective (say 1 week) then I’d rather choose a futures instrument to trade. If I’m bullish with constraints attached (example – I’m expecting the markets to bounce because of a great budget announcement, but I don’t want to risk much) then it would be prudent to choose an options instrument. So the message here is – the market participant should develop a point of view and complement the POV with the right trading instrument. A well researched POV combined with the right instrument to trade is a perfect recipe for market success. Also by now, hopefully you have got a sense of how all the different modules in “Varsity” play an important role in assimilating the market. So keeping this in background, go ahead and explore the content on Varsity at Zerodha. The next two modules will explore concepts that will help us develop POV based on Technical and Fundamental Analysis. After reading through these two modules you will get a sense of developing a point of view on markets. The later modules we will discuss the different trading instruments that you can choose to complement your point of view. As we progress along, we will ramp up the flow to help you start calibrating your trades with effective risk management techniques. Sir I had some doubt regarding the purchase of stocks of a company. After listing a company in stock exchange they are actually selling their share to the public, right. If company xyz issues 10rupee 10000 shares to the public, and I bought a 1000 shares of that company at rupees 10000. After some time I wish to sell my share. Then I ll put an ask price for my shares. What will happen if nobody buys my share? Well, this depends on the liquidity of the company. For a really large company like infy there is always someone buying and selling its shares…however there are some really small obscure companies in which trading does not happen…even if it does the volumes are low. So you need to make sure there is ample liquidity before you take positions. In simple terms, like any traditional business that involves buying and selling trading is not any different. By liquidity we mean that the shares that you purchase should be easily sell-able. In other words if you purchase a stock that nobody wants then you will not be able to sell it. I have a question which bothers me. The volumes of shares like MRF and Eicher are always low then how do the price move so much in a day despite low volumes? When volumes are it is actually easy to move the price, even a small buy-sell can influence the price. Excellent material with quality content. Thanks Zerodha. Thanks for an introduction marked by clarity, and simplicity of explanation. Was very useful in following the material. Sir, we are mere mortals, cant afford to even be present in the vicinity of stalwarts like HC Verma! In fact most of the candlestick patterns explained is with a perspective of short term positional trades. Request you to kindly go through the same. sir pls explain about top line and bottom-line growth. I can not understand about topline & bottom line growth. in “sort” type of investment 1st i have to sell and then i have to buy share but in how much time i have to buy?? In cash segment you can only short only on a intra day basis…which means you have to buy it back before the market closes. What is ‘sort type’ of investment ? Sir, Excellent article. I would like to know and attend your class room course,if any. Thanks Ashok. We do not intent to conduct classes…all the content will be made available on Varsity itself. Thank you sir for providing such a wonderful platform for learning. The way you explain is so simple, interactive and easy to learn plus the pictures make it very interesting. – AWESOME!! Stay tuned, we have more things coming up here! Hey! This modules are easy to understand. Thanks Zerodha. I could see only till Chapter 10. Where are others? There are about 14 chapters in this module – https://zerodha.com/varsity/module/introduction-to-stock-markets/ , can you try refreshing the page again? There is lots more to come on Varsity, please stay tuned 🙂 We are working on Futures Trading, the module will be posted by Jan 2015. Very helpful, for the novice like us. Learned a lot, keep up the good work. Thank you. MAn Karthik who are you man ? .. Am bowled seeing these posts … U r awesome … I have searched for years to find things and you nailing them on one board .. Kudos to your effort … Am Jaga a Systems Analyst by profession. Would like to know about your profile is that’s ok..
Lol 🙂 Thanks for the kind words. You are making me feel like a hero! Like many of my motivated colleagues, I’m too working towards making Zerodha the best financial services firm in the country, this is my bit towards that. Please stay tuned, we have planned a lot of good content for Varsity. All of which will be up over time. Thanks a lot team. I had no knowledge about share and stocks before reading this. I thought just buy and sell. Now I have a different picture about the market. Will finish all the modules and start trading soon 🙂 Thanks again…..
Sure Balraj. Stay tuned, there is lots of good quality content lined up on Varsity. Thanks a ton. Clear and concise introduction to Stock markets. My journey into value investing has truly begun. Averaging is a term used when you buy shares in order to vary the cost of transaction. For example – Initially I buy 100 shares at Rs.20, cost of buying is Rs.2000. Next the price comes down to Rs.15, I buy another 100 shares this time the total cost of buying is Rs.1500/- and the overall cost is Rs.2000 + Rs.1500 = Rs.3500. Divide this by total 200 shares, the average cost of buying works out to 3500/200 = Rs.17.5. Therefore initially I bought at Rs.20, now I averaged it at Rs.17.5. This is called averaging. Try learning technical analysis for short term trading. which one is the best option strategy…? There is nothing like the best strategy that I’m aware of. Awesome ! hats-off!! excellent initiative !!! happy to be a Zerodha customer. Glad to know that, please stay tuned for more. Suppose I dont have cash in my zerodha account, then I buy some shares with value X in the morning using leverage. The share price goes high in afternoon. And now the value is X+Y. And I sell them earning the profit of Y. Then how much interest I have to pay? If I sell them BTST then how much interest? I how much time span I should pay out leverage to zerodha? You cant do this, as you need to have a cash balance before you can employ leverage. I am not able to understand how to buy shares if no balance in Zerodha account ? And am also not able to understand your reply. To buy shares for delivery you need to have 100% cash. For example if you want to buy 10 shares of 100 Rupees each, then you need to have 1000 in your account. Lot of learning on basics of a share market. Good content. Lucid writing. I wish, I had gotten it earlier. Looking forward to more. Thanks, we are still working on developing the content…we are working on Options now. Please stay tuned for more. In this case you will get only 1 stock @ 300 and the balance 2999 will be pending order. Remember this is a limit order, hence you will get a fill only when the price meets your specification. This is a huge area, I would suggest you start with Willmot Forums. B1, B2, H1 etc are all different series in the markets. For normal equity please select “EQ” series. Sometimes the scrip that you want if not in EQ will be available in B1 series. If the scrip is in B1, you cannot do intraday trade on it. To add stocks to your marketwatch, please use the drop down menu. If you are trading with Zerodha, then please do contact +91 80 40402020 for more details. Unfortunately we do not conduct training sessions in a phyisical set up. Sir, please explain what is de-listing and its impact on share holders? De-listing happens when a listed company wants to pull off their shares from the public market. Usually when a company delists shareholders will get a better price. For example company ABC is trading at 100 on NSE, the company decides to delist, then the company is expected to delist at a premium …so maybe they can offer 130 or 140. Sir,, if a company comes for public issue with floor price and price band of 500 -520, and if lead manager decides the issue price as 510,, then at what price it will be first listed in stock exchange? Listing will be at 510….and based on the demand supply the stock can open much higher or lower on the listing day. IF I already have shares in my holding and I take a short position (intraday) and then close it before the market closes by buying it, will my holdings remain intact or there will be First in First Out impact on it? I dont want my holdings date and cost to get affected by intraday trades. Please provide clarity. Thanks. I’m assuming you are trading with Zerodha – so if you do intraday the order type is either NRML, MIS, or BO/CO….so this order type ensures that the trade is intraday and hence does now interfere with your holding. For you to square off from holdings the order type to use is CNC. My question is “who provided other 25 lakhs ruppes and who controls/owns 25 LKHS shares in company’s account” .Based on the seed funding by promoter( 20 LKHS) and angel investors (2* 2.5 LKHS), shares are allocated. How shares are allocated under company’s account ? Sir, read your message and felt really happy. Thank you so much for the kind words and the encouragement! Sir fabulous article full of knowledge with complete explanation. If I do good in this market it will be all because of you and if I do bad it will be my fault. I want to start trading, can you please guide me through. I would like to know about opening de-mat account, particularly please tell if I can handle all procedures online? Someone from our sales team will call you back within 30 mins and guide you through. thankyou karthik ! is it possible to send e-mail instead of calling? I will be in town only by Monday. Sure, please do email [email protected] and he will do the needful for you. Thanks. can you please tell me what is this discount broking and how is it different from full broking? Simple and amazing content, compatible and easy to understand for both rookie and an elite trader. in modules chapter 8 to 10 is not updated why? sir, i have studied some modules completely. they are very helpful for a person like me who hails from defence background. i want to suggest that this information can be more understandable and attractive if it is in the form of short videos. Thanks Tarun. Videos take a lot of time to make, hence we decided to keep it in text form. Hi Karthik. I have just applied for a demat and trading account with Zerodha. I went through your Module 1 and it has provided a quantum jump in my understanding about many Stock market related queries. Keep up the good work. I am eager to complete the other modules now. Sir please may i inquire about when we can get currency, commodity section topics listed on varsity. just a general query . what are your views about a CFA qualification from US -CFA institute ? does this add any value to our trading / investing performance ? You need it if you plan to build a career in investment management…but not really required for personal trading and investing. lets say a retail trader /investor after years of consistent returns wants to set up his own hedge fund or AMC ….can he attract outside money based on his returns or people still look upto paper-qualifications ? for an avg . retail trader what is the best method to improve his/her trading performance ? Well it really depends on how well you can communicate with clients. If your clients know you well, then qualifications does not matter, but to attract new clients, qualifications matter to some extent. Also, I think SEBI needs qualification and relevant experience certificates before issuing the licence. Suggest you double check this. What is the meaning of Hot and Cold with respect to stock market. You buy if you are bullish. What is nifty buying ? i am a beginner and start investing with zerodha along with reading the phase-wise lessons of your varsity section. its really really nice job and being a knowledge-less person its very informative. i have a suggestion to please recommend the stocks to your account holders for that you may charge minimum fee, if so that would be a great help to the investors who are investing in the stock market for long term perspective. As a company we are against recommending stocks. Instead we like to educate our clients so that they can take informed decisions themselves! I read chapter 1 & 4 thoroughly. As I am planning for long term investment, I think fundamental analysis is enough. Do I require to read all chapters? Please suggest. You just need Fundamental Analysis for long term investing, and nothing more! One small request, if you launch trading practice demo account with live feed market data on existing platform (pi or kite), it’s very useful for novice trader and new upcoming person. In fact we do plan to have something like this. Will keep you posted. Thanks. One more small doubt for me. If the stock is de-listed from the exchange. Then, how can i trade the stock and why the stock de-listed from the exchange. How can i protect from this trap? How select the stock? If the stock is de listed then you cannot trade it. In fact, if a stock that you hold is about to get de listed, then it usually gets delisted at a very high premium to its current price, which is really good for the investors. Why not separate module on Quantitative analysis on varsity. Hi Karthik, I have a question for you. I have not started trading yet and after completing the first chapter recently, I’m in the initial pages of Technical Analysis. All I know about Stock is from your first module. I know you’re coming for the stock portfolio session in IIM Bangalore, wanted to know if I could attend the session with the knowledge that I have. I intend to focus on ‘Options Trading’ at the IIMB session and nothing related to TA. The session requires registration, I got to know about it from FB, and saw your name there. 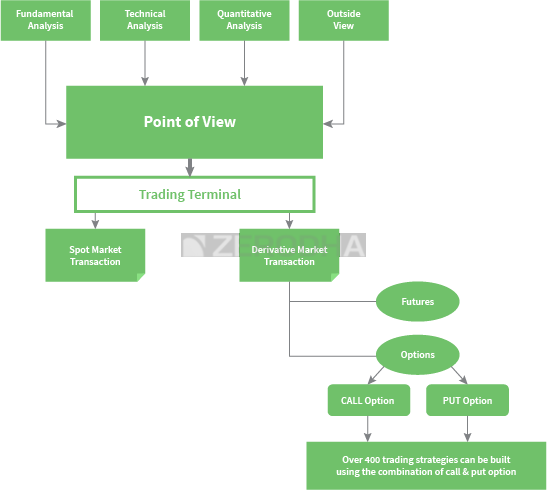 I don’t have an idea of ‘Options Trading’ at all, does that mean the session will be difficult for me to understand? Ah no, the topic is changed to Portfolio creation and management. Apologies as my question is not related to this chapter. Today 21 Oct 2016 – NBCC offer for sale for non retail investor(floor price 246 and 5% of on cutoff price) – I thought to apply but I saw its trading on 242 on open market. 1.What is OFS and what are its benefits? 2.In above case why some will buy through OFS or what is better? 3.How discount is provided? at the time of purchase or later? I’ll try and put up a detailed chapter on OFS sometime soon. But as per today’s scenario what should be the best option to buy through OFS or direct from Market. Please suggest. Well, if the market gives you a price which is less than OFS then you are better off buying from the market directly than OFS. In Chapter 6 you have mentioned: Day Trader – A day trader initiates and closes the position during the day. He does not carry forward his positions. He is risk averse and does not like taking overnight risk. For example – He would buy 100 shares of TCS at 2212 at 9:15AM and sell it at 2220 at 3:20 PM making a profit of Rs.800/- in this trade. A day trader usually trades 5 to 6 stocks per day. and in Chapter 10 you have mentioned: All equity/stock settlements in India happen on a T+2 basis. My question is: If i am a day trader then how can i buy and sell the same stock on the same day when all equity/stock settlements in India happen on a T+2 basis. Well, when you trade intraday, you close all the positions by close. Therefore you are fair and square. However, if you want to purchase a stock for delivery, then you will have to buy…and the settlement happens on a T+2 basis. By settlement i mean, the act of the stock hitting your DEMAT account. Requesting you to please explain with an example . You buy TCS at 9:30 AM and sell it anytime before 3:20 PM (using product code MIS, Bo Or CO) then its considered an intraday trade. However, if you buy TCS with CNC as your product type, then you are essentially buying the stock to hold for few days. Settlement in such case happens on a T+2 basis. I guess you messaged on Linkedin as well….as I mentioned, it makes sense to learn TA, it helps you develop a point of view. Maybe you could gradually move to quantitative technique. will recommend it to anyone who wants to learn the technicalities of stock market. Happy to know you liked the content here, thank you so much! sir, I want to start investing in stock market but there is a little fear. I have studied a lot and had also done a course of technical analysis.But whenever I start playing any virtual game of stock market I just end up that I know nothing. what should i do??????? Have confidence in what you’ve learnt and place a trade. Can we place short sell order through CNC if we know that the trend in the particular stock is bearish and the trend will continue for few trading days…? You should be using MIS here. Can you explain multiple day short position? I thought both BSE/NSE does not allow such shorting and carrying position to multiple days. it is settled on the same day. If i do not own the stocks how can i sell them, unless i buy it at the end of the day to square of the position? Yes, you can only short spot on an intraday basis. To carry positions overnight, you need to look at futures market. i recently opened an account with zerodha , i have a quiery ,when i tried to place an order there is an option like VALIDITY: DAY OR IOC what is the meaning of this? 2nd doubt if i enter a scrip name in wishlist like reliance it is showing RELIANCE-BE, RELIANCE-BL what does that mean. A day order is valid until it gets executed or till the end of day (market close). For example, if your order is to buy Reliance at 985, then the order stays in the system till Reliance hits 985. Immediate or Cancel (IOC) on the other hand checks for the price, if it is 985, the order gets executed, else gets cancelled. If you are just starting, I’d suggest you stick to EQ. Thank you so much. I am going to read all the other modules as well. Nd i would return the favour by opening an account with Zerodha. Good luck & happy learning. Just wanted to confirm that, isn’t it that all the 5 other charges other than Brokerage will be same irrespective of the broker you choose ? Yes, they are common across all brokers. Thanks Zerodha great material easy to understand , i am planning to invest real soon . Right now i am gathering all the knowledge that i could before going live . Thanks again Zerodha it would be very difficult without to understand the concepts so easily. 1>is stock operaters exist in indian stock market. 2>how to identified stock in which stock operaters exist. 3>how to analys operater intention that he want to move stock up or down. 3) To some extent, the charts would help. Thanks for the all the information. Great medium for beginners. Can u share some information regarding how different is your company from Futures First. I know they trade their own money, they do not trade public money and also they do not trade in stocks. FF is a trading company, they trade their own money. We are stock brokers – we give you the access and infrastructure to trade the markets. Along with this, we give a host of other services, including Zerodha Varsity. How is your work different from investment bankers (managers)?Also can u suggest how or what other skills are required to make a transaction from trader to investment banker? IB’s offer a whole host of services to corporate like – Mergers, joint ventures, acquisitions, merchant banking, stock broking, structured products etc. We offer just stock broking (at least for now). Thank you for creating this ! Its fabulous. Most importantly, the content is relevant, easy to follow and hopefully retained. I am a doctor and have always hated finances due to its jargons and complexity. Usually, I start studying these things and loose interest very quickly, given the dry subject and difficulty understanding. I spent entire day reading the first module and I am feeling enlightened. In fact, I am so looking forward to the next modules ! My question is not related to this chapter but still please if u could help with this. What should be done if i have brought shares of some company and companies losses are rising every quarter and revenues falling every quarter and in near future also company is not giving much hope. (Like happening for IDEA now).What should be done to minimize the losses?? Sell the stock, book a loss, and look for other investing opportunities. Wow!! I have never understood stock markets before. Your explanation is so clear for beginners like me. Thanks a lot, Karthik and Zerodha team. Happy to know that, Mrinalini 🙂 Happy reading! Amazing content…!!! Request to add a chapter on Mutual Fund/SIP..!! It is in the list of modules, will do that. Thanks. I am a client of zerodha, I want buy IPO, How can I. If i use cover order for equity (intra-trading) and use leverage because of insufficient funds, will there be any interest ? and also it is showing on my dashboard that 2.41k margin available, what does that mean and will any interest will be charged? That is the margin available for you to trade. No interest will be charged. I just finished reading Module 1. In one of the above comments you said you will be adding content on Mutual Funds and SIPs – really looking forward to that. Thanks for the kind words, Jinal. A module on personal finance is long overdue. Will do something about it soon. We will be happy to welcome you to the Zerodha family! As per my understanding I can invest in a particular company under stock market. But how to invest in nifty as its an index comprised of several companies? You can buy the Niftybees, which is basically an ETF based on Nifty as the underlying. Karthik sirrr, you are doing a great job……..Really thank you sir. Happy to head this, Vijay. Good luck and happy learning. Excellent content. I know most of things but still some new concepts are cleared. Thank you zerodha. Sir , if we hold a scrip- infy and we want to do BTST in the same script ,how can we do it since FIFO we sell the shares from demat ,and will FIFO also apply if we do intraday trade in same script (infy). Excellent Work Karthik !! Much Appreciated !! Request you to advice regarding quantitative analysis. If i wish to trade as a swing trader, would the volatility distribution explained in “Options” module be sufficient for me to get a POV (as far as QA is considered, in addition to POV from TA and FA ). If not, request to add that module. Also i understand, getting a POV by making use of your technical analysis module, i may trade at 3:20pm (same day)or 9:15am(next day) by considering 3-6 months candles. But what do you recommend be the number of historical candles if i wish to trade during the day. And is the pivot provided by zerodha kite,obtained on the same lines as that explained in the “Support and Resistance” chapter of TA module. Lastly does zerodha provide quantitative charts(Volatility distribution chart as explained in Options Module) in any of the platforms, if not do you suggest any forums or platforms for obtaining the same. Alternatively i can also use the spreadsheet provided in the “Volume Distribution” module, but request you to suggest the history data for the stock i need to consider if i wish to be a swing trader. 1) Yes, it certainly does. 2) It really depends on your outlook. For example, I mostly look at EOD charts for intrday for at least 3 months. Some people only look at last 3 days data…and some look st last 15 mins data. So there is no right or wrong answer here. Request to suggest a good website for economic market calendar, where i can read about key events of the market. Have you checked trading economics site? Thanks Very Much Karthik !! 1. Trading Economics Site has lot of useful information. Request to let us know if impact of Key Events Globally on Indian Stock Market. 2. Also wanted to know if there is a site where i can find time of declaration of corporate earnings as in trading economics, as most of the websites i have found only have dates but do not mention time. And at trading economics, i was unable to find Indian corporate. 3. And lastly, as Indian Citizens are we allowed to trade in global markets such as US. Is there a similar concept as FDI for US markets. Also would like to know your opinion for trading in US markets. My reason for trading in US market would be to take advantage of dollar conversion rate, ie if i manage to make profits in dollars, i can be at an advantage as i would still be spending in INR only. 1) Yes, it is a very resourceful site. 3) Yes, you can. But RBI has a restriction on how much you can invest. Guess its 25K USD. The best investment in market is your investment in learning. This is the only investment where returns are guaranteed :). The more you invest, the more returns you earn. I would like to pay my sincere thanks to zerodha and specially, many many thanks to Karthik Ji as I learnt a lots from Module 1 which could be possible by your noble efforts. Good luck, Sunil. Happy learning. Very good content for beginners , simple and right choice of words, learned lot of things ,and cleared many doubts, thanks. You will have to just place the order everyday with a hope it will get executed. No other way out here. sell margin 76968 why that much difference (128520)?? 2) i observed some times futures price is trading at lower than spot. 1) Futures margin is the same for both buy and sell, they cant differ. Are you sure you are looking at the right contract/right number of lots etc? Please do recheck once. 2) Yes, there are at times when futures trades below spot (referred to as discount) and at times, futures trades above spot (referred to as premium). This happens due to the natural demand and supply situation in the market. However, the overall price movement in Futures is based on the spot prices. is rejected with message , rms: margin exceed.required 9375. It should be 750, I’m guessing you had some other open order or something. Can you please check with our Support executives once? Day order is valid for the entire day but IOC is immediate or cancel. For IOC to go through, both price and quantity should match with what is available in markets. Do you guys have any learning material about mutual funds? I invested Rs.5,00,000 in a liquid fund (Peerless) through Zerodha in October and when I checked a couple of days back the current value is below the original amount. In other words, I lost around Rs.2000 in 8 months. I thought liquid funds were safe enough. Can you explain what may have happened? Thanks. Let me check this and get back as soon as I can. Karthik, do you have any update on this? The entire guide is really productive for a beginner like me. Truly remarkable guide to start with. Brilliant tutorial! THis guy must be a maths teacher! If any company issue Bonus share 2:1, then its prices will be half. Then don’t it will affect the Nifty of Sensex if its in Nifty-50 or Sensex-30…..as they calculated by averages of them…!!!! If the company is listed on the index, then it does have an effect. The effect of this will be taken care by the index management company. Thnx…!!! Can you elaborate…if possible..!!! The Index management company will adjust for splits and bonus such that the index does not show up erroneous values. No, as per RBI, you cannot trade leveraged products overseas. The main reason of the company going public is to raise funds for its expansion. if an early investor wants to exit, which one would be considered as priority? will the company and the investor will sell there shares separately to the public? They will all have to transact via the stock markets. How can we check the shares holding period? If you are trading with Zerodha, I’d suggest you check the Q backoffice > portfolio > holdings. Under the stock names in holdings, click on ‘+’ icon and you will get the number of days you have been holding on to the shares. Just want to know as a bigenner which type of trading or investing one shud be doing. I have no idea about trading but have inclination towards shares. If you are an absolute beginner, I’d suggest you start with investing. Happy to know that, Rajesh! Yesterday I purchase 1000 shares of SBI @ RS 300 [say] at Intraday Trading Zerodha Platform, after some moment it hit a Stop Loss and I lost Rs 2000/- on the trade. In this case how much would be debited from my Zeroda Equity Balance. I think RS 4000/ was debitted from my account. Kindly explain such scenario , I am new to trading…. If i convert my position of XYZ from MIS to CNC before the squaring off , will margin available on my stocks till T+2 ? or do i need to add money at end of T day? You need to have the required amount of money at the time of conversion. You need to open a new account with Zerodha, I’d suggest you use the onscreen instructions here to open your account – https://zerodha.com/?ref=varsity. Good luck. can shares from one demat account be transfered to another demat account. Three weeks ago, I started thinking about investment. I started out with knowing about mutual funds and then two weeks ago I started to look for trading and how to do it. And then, a week ago I found this. This is the most awesome content that I have ever read on the internet. It’s really helpful and everything is in place for the beginners to start with. Too good. Thanks for providing the required information in a contained format. There is no direct benefit for the company from the daily trading that happens on the exchange. Then what is in-direct benefit for the company ? The benefits are reaped when the raise funds via IPO. Of course, the network of the promoters is also dependent on the share price. Does Zerodha offer a practice demo account to practice day trading? No, Alex. Unfortunately no demo account. I have no words to describe the beauty of your articles. This is very very helpful to guy like me (I.T professionalist) who have a great zeal to invest in market but always fear of “share market is gamble and always loss” but i always believe to first go to deeply to understand then will be able to judge whether this is really a gamble or mind game.. I was looking for an online material to get basics and market running fundamental knowledge and by luck found this website. Thanks for the kind words, Saurabh. Words like these motivate us to put up better content. I have following queries with respect to share market . can you please help me to understand this. 1) Does company growth totally dependents on share market value. For example : An I.T company share market prices are getting down by 50% (from 500 per share to 250 per share) but company running with all existing clients so does this prices down will start layoff in company or what does impact of low share prices for any individual company. 2) Personally , i want to retain share for longer period then want to sell it out so is there any different category for this .As i knew that in intra-day share will be buy/sell on the same day. 3) what is an ideal way to open trade/demat account . With broker or direct with bank. For example : should i go with sharekhan/zerodha or icici direct . which to select and why? Thank you very much Karthik . i read the entire Module 1 that is all 13 chapters in one go . The language used is very simple and you have explained the most complicated things in the most simplest and interesting way. Thanks Again .God Bless You. Thanks for the kind words, Anand. What if broker like Zerodha closed overnight….!!!!! I mean what would happen to my funds in zerodha a/c and shares owned by me…!!!! Yes no doubt on zerodha…!!! But what about if any other broker like zerodha closed suddenly….!!! what are govt rules regarding that…!!!! just curiosity….!!!! The charting indicators option is not showing in the kite web browser in my mobile phone after formating it at service centre. Can you please guide. Well, can you try reinstalling your browser? Enjoyed reading! Many concepts cleared in a very simple way!! Thanks for sharing. Can i sell the share on next day or same day (if i select CNC type)? Because in module i learn that we recieve share on t+2 day then how i sell my share before i get it. would like to know how one can use margin trading. I am currently using kite. Is it possible there. How can I put stop loss in option trading. Example: I bought a LOT of JET AIRWAYS 600CE Sep @ 15. And now it is trading @17. So now I want to sell it @18 if it touches 18 but also don’t want to sell less than 16.50 if it goes down. Please advise. You will have to place a SL at 16.5 and track the position to sell at 18. This is the only way to do this, Veer. Hi, I am new to stock markets and your materials providing me great knowledge from basic. I have query on short position, in which first i sell some stock and then i need to buy it to close the existing position. Is there any timeline to complete it and what if i don’t complete it. Yes, if you are shorting in the spot market then you will have to close the position within 3:20 PM on the same day. However, if you are shorting in Futures, then you can carry forward the position overnight. 1) how can an indian trade in international market say US from india? 2) Who should be the broker in that case? 3) does an indian brokerage firm allow to trade in say US market? 4) I have listened some people trade in gold in the international market, how do they do that? I wish your dream comes true and you indeed become a key player in the markets! You should use the product code as CNC. CNC means cash and carry and is used when you want to buy shares for multiple days/weeks/months etc. Your lectures are awesome. I have a question for you. what if I bought a stock in cnc and sold it on the same day.Can I do CNC for intraday trading? Yes, you can do that and this would be considered as an intraday trade. IOC is immediate or cancel, you can use this to place orders when you are particular about the time of execution. The day order is valid for the day. My order got rejected and it say Rule:check holdings, no holdings present for entity account-ZP8084across exchange across segment across product. It was showing stocks in my positions. but i was not allowed to sell, order was getting cancelled with the above message. This happened for half an hour. After that I could sell them. Why is that happened? Can you check this Tradingqna post? how are the payment gateway charges for zerodha? How are DP charges applied? is it 13.5 per stock of same company? or 13.5 even for 100 stocks of same company? The payment gateway charges is Rs.10.63/- including 18% GST. DP charges are applicable when you sell shares from your holding. This is on a per script basis, does not matter how much you sell. I have a questions . I have a 9-5 job . Is there a paid sms/whatsapp service that will send market alerts before moneycontrol, etc. My idea is to trade the news flow for a few minutes.Please advise. Not sure about this, I’ve never tried such services, Sashi. Thanks for such a quality information about stock market explained in simple way. Really helpful for a beginner like me who literally didn’t have a knowledge about the stock market before opening account with Zerodha. By the way, welcome to the Zerodha family! Where are you getting stuck, Prasad? I just loved reading varsity. Though i have still one question in mind regarding IPO. Can a company get listed in secondary market instead of going through the process of IPO? Yes….. a through reverse merger a private company can do so by acquiring any listed entity. Glad to know that, Abhi. For a company to get listed, it has to go through the IPO process. What is face value of a stock? What’s the difference between this and stock price? Face value is the nominal value of the share at the time of creation of the share. The stock price is the price determined by the market participants. So, for a stock to be considered as performing well, it’s current stock price to be greater than face value , right? No – this is not true. The only indicator for the performance of the stock is the % return the stock generates! Sir you have said that scalping is essentially buying and selling of stocks in large quantities, for a small price difference. Now, what is large quantity? Would a number like 25000 qty of a particular stock be enough for scalping? This again depends on the stock price. If the price says 10, then 25K is not much. So instead of thinking in terms of quantity, it makes sense to think in terms of the value of transaction. Thanks for the kind words, Kamil. Happy learning! how many modules are covered in zerodha varsity? why cant i see the 11th module ‘financial modelling for investment practice’ as mentioned above? So far there are 9 complete modules and the 10th one on Trading Systems is ongoing. Maybe after this will start a module on FM. thank you so much sir…. learn much and you make easy to understand basics. I will start read module 2 soon. Thanks a lot for sharing such a good content. Glad to note that, Heer. Happy learning! I have question, I wonder in a falling market like the one we saw in 2008 and 2013 where market was on a freeflow, how a person can sell a particular stock? I mean there should be a buyer right? Why do anybody wants to buy in a free flow market? Sir you’ve written about how to develop a POV using fundamental and technical analysis. But you never got around to quantitative analysis. If it’s not on cards anytime soon, can you suggest some books on the topic? In fact, the current ongoing module on Trading systems – https://zerodha.com/varsity/module/trading-systems/ , revolves around quants/stats. Do take a look. Thanks. What are the different basis for trading? I know trading based on Fundamental, Technical and Quantitative approach. What others forms of trading is there? Sir to be clear, I’m asking about the basis on which trades can be taken, like based on market profile or technical Analysis.. And not the time frames. It’d be greatly helpful if you can guide me on this. BTW, enjoying varsity very much.. Have recommended it to all my friends and colleagues as well. Thanks in advance. Thanks for spreading the word about Varsity, Sundeep. Selecting the time frame is secondary. If you opt for TA, then something like candlesticks will help. For investing, nothing beats Fundamentals…and for short-term trading, you can consider something like pair trading (based on stats/quants). These are the three main categories, Sundeep. Sir what are some lesser known methods/basis for placing a trade apart from those three? That’s what I wanted to know. Thanks for the amazing write ups sir. Sir I have few more doubts. How would you classify placing trades based on market behavior? Like volatility is high on stocks surrounding news. So short the same. What kind of trade is that? Since its a bet on Vol, I’d peg it to QA. In fact, you can use ATR indicator to get a sense of Vol, that would be TA. Excellent Article. Was able to learn many new things. Need to learn about the derivative markets in the coming chapters and developing PoV. Glad to know that, Sajeev. can you please elaborate the above? It’s a tad bit confusing. You will have to spend sometime on normal distribution for this, have explained the same in options module. Request you to read through it. Thanks. Even I got the same doubt and confusion…. Like I mentioned, a lot of it will make sense as you progress through the modules. Can you please elaborate differences between last trading price LTP and close price of equity stock? Happy to know about new thing and in the best simple way,these things are happening in front of us on daily basis and we have to know behind the scene. Hi!! Thank you.Must say an excellent article for beginners. So Karthik I don’t understand the last part of this module. 1)What is an MACD indicator? 2)What is PE ratio? And third standard derivation? The terms are explained in their respective modules (MACD in Technical Analysis and PE in Fundamental Analysis, and Standard Dev in options and trading systems). I used these terms here to give a sense of what to expect. is it necessary to buy the stock the same day you shorted? if yes,why so? Yes, otherwise you will have to give delivery of shares. Hence to avoid this, you close the position the same day. Thanks for explaining the contents in a easy to understandable way. I have a query. There are approx 5500 stocks in the market. At the starting point, how to pick up a winning stock/how to select stock for analysis? Could you please provide some guidance on this. Arundathy, I’d suggest you stick to the Nifty 50 stocks, at least when you are getting started. Sir where is this quantitative concepts.I couldn’t find it.will it come after trading systems.BTW you explain any thing in such a plain practical way and so effortlessly that after reading it feel like WOW. Check this – https://zerodha.com/varsity/module/trading-systems/. It is all about quants and stats. what education or degree course would you advice which will help someone who wants to do stock trading for a living (only for own business ,not considering and requiring any job ) . I don’t think there are any courses designed to do that. You just need to read a lot of content and develop a path ahead for yourself. whats your view on cfa course.will it be helpful? Yes, certainly, more so if you are looking at a career in Asset Management. I have doubt, Can any retail investor like me be able to buy shares of MRF or Eicher at the lower levels? Meaning, will these share price comes down? either by way split or bonus or will it fall to its lowest level? Dow and Hang Seng, certainly has an influence. You have explained it in a very simple manner. It’s very easy to understand for a beginer. one small doubt what is the crriteria of being called as retail trader in indian contest. i mean is it the trading account capital from which someone trades or else. There is no formal definition for this. Generally, if you are an individual trading the markets, you are considered as a retail participant. When is the 11th module gonna come? Awesome content !! The way it is explained is simple and clear. Glad you liked the content, Dinesh. Happy reading! Apart feom zerodha’s fabulous content the comment section is also interesting after reading 413 comments your 413 doubts are cleared. cheers!! If you think the stock is going up, your POV is bullish hence you would be a buyer of the stock. Likewise if you think a stock is going down your POV is bearish therefore you would be a seller of the stock. The thing is, you buy when you expect the price to go higher. Likewise, you sell when you expect the price to go lower. e.g. pur price 100 sales price 90 then benefit?? Then that would be a loss. Glad to note that, Lalita! This is truly fantastic. Really appreciate the efforts you have taken to explain all the required concepts. You just made stock market interesting for a total newbie like me! Hope to dig in further, especially curious to learn about derivatives. Can you suggest a good read on it, or is it already included in one of Varsity’s sections? Glad to hear that Saurab! Varsity’s section on F&O is a good start, it gives you a good understanding of the basic concepts. There are plenty of books which you can read later on. Really depends on your area of interest.